A stormy evening closes in on a villa not far from Lake Geneva. The group of friends gathered there read ghost stories to pass the time. Inspired by these tales of the supernatural, one member of the group proposes a challenge to the others: to write their own horror stories. Sounds like the makings of a scary movie, right? 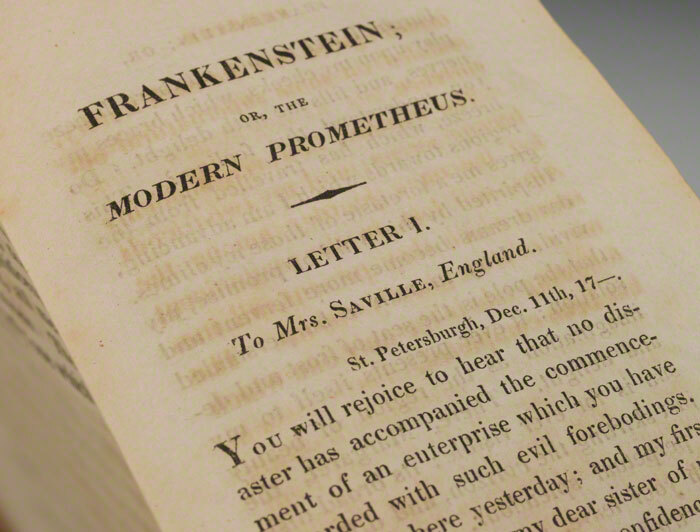 Frankenstein; Or the Modern Prometheus, first published in 1818, is more than just the story that would give us the classic 1931 movie that, in itself, became the inspiration for many a costume for future generations. It is cited as a progenitor to the modern science fiction genre and a landmark in literature. And yet for five years after its initial publication in 1818, it was seen as a mystifying novel by an unnamed author. 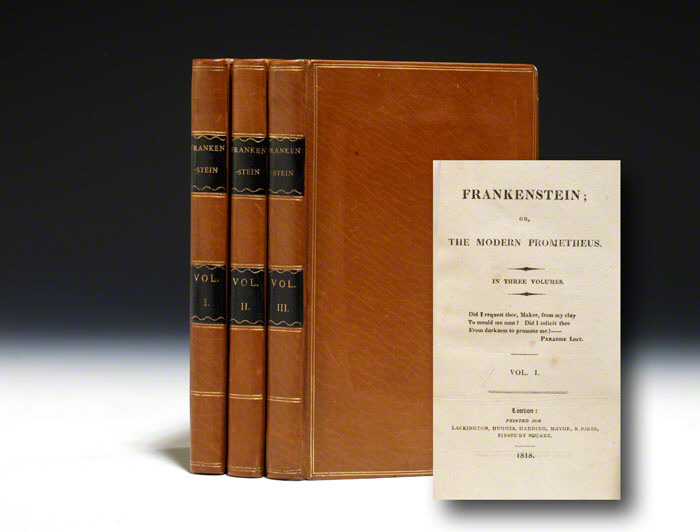 There were suspicions as to who the author of such a frightening tale could be (including Percy), but in 1823 a second edition was published and the author was revealed as Mary Wollstonecraft Shelley, Percy’s wife. 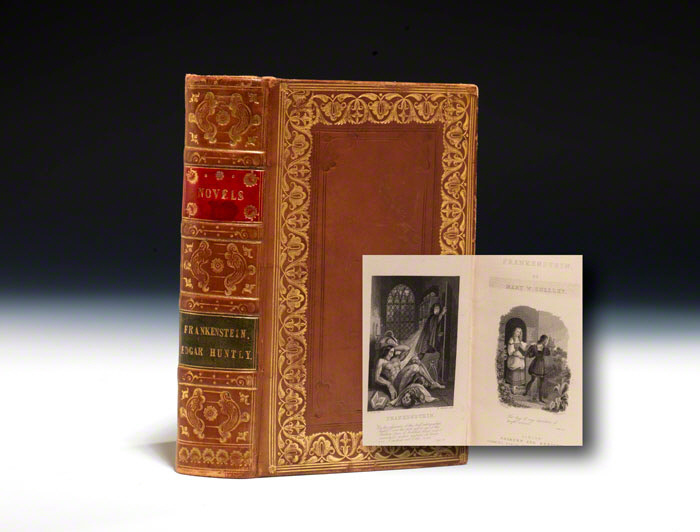 Incredulity persisted because “How can…a young girl, [come] to think of, and to dilate upon, so very hideous an idea?” Disbelief was so strong as to lead Mary to address this in the introduction of the third edition of Frankenstein, published in 1831. She wrote that upon Byron’s challenge that night she “busied [herself] to think of a story … to rival those which had excited us.” She fell short, and every morning when asked, she admitted that she did not have a one to share. However Mary was no ordinary girl. She was the daughter of two literary celebrities – her mother, Mary Wollstonecraft (the women’s rights activist who famously authored Vindication of The Rights of Woman) and her father, William Godwin (a noted radical, philosopher and novelist). She enjoyed (and sometimes endured) an unusually creative and educated childhood. In creating Frankenstein, Shelley reimagined and updated the myth of Prometheus from the work of Homer and plays by Aeschylus and Plato. She introduced the notion that human creative genius can create miracles, but that these miracles can also turn on man, and even lead to his destruction. Victor Frankenstein is Faust all over again, striving to use the human mind to achieve power. But this time, not only is just a soul lost in the quest for power, there is also the threat of the destruction of human society. Since then, “You are my creator, but I am your master” has served as the most powerful metaphor for science out of control. Shelley’s novel has been confidently categorized as a “gothic romance.” But she did more; she created the basic science fiction formula. When H.G. Wells peopled the future with Morlocks in The Time Traveler or Emile Zola imagined the ticking time bomb of miners in Germinal, they were picking up and carrying on the torch lit before by Mary Shelley. However, creating a new genre is only one of the most remarkable features of the story. What is wonderful and amazing is that this woman, barely more than a well educated girl, created a tale that was imaginative and terrifying as well as prescient and morally profound. (*) From this challenge, John Polidori would also publish Vampyre – the first vampire story in English literature. Percy would publish Prometheus Unbound, which, very much in the spirit of Romanticism, celebrates Prometheus who in Greek legend defied Zeus and brought the fire (of creative genius, so the Greeks believed) to humans. Watch the trailer for the 1931 film production of Frankenstein, which created the image of the monster that continues to inspire to this day. Debbie is a bookseller at the Las Vegas gallery of Bauman Rare Books. She joined the company after graduating from Bryn Mawr College where she majored in Political Science and double minoring in French and International Studies. Her interests are eclectic, but some of her favorite authors/historians include: Joseph Conrad, Truman Capote, Dostoyevsky, Chalmers Johnson and Joseph J. Ellis.